you will understand, no doubt, why it is that a raleigh twenty shopping bike with a sturmey archer three-speed gear was hardly the velocipede to match with a future athlete. not only would one be left far behind in the sprint, but there's little doubt that one's ability as a grimpeur would have been severely curtailed by that large shopping box affixed to the rear rack, to say nothing of the hub dynamo. thus influence was brought to bear upon the parent with access to the purse-strings to look to the number one son's cycling future and investigate the possibility of a ten-speed racer. after all, number two son had owned a new one of just such a species for more than just a year or so. and so it was that parent and son took a trip to benzies cycles, just down from the library in order to access a whole heap of extra gears. "you don't want to get involved with one of those," said mr benzie in his heavily aberdonian tinged accent. "i have nothing but trouble with those gears. the chains are forever falling off." strangely, i can recall no such argument when he sold my brother his ten-speed racer, but the fact that he seemed not to have any appropriately sized models in stock may have been at least partially responsible for his curt dismissal of my chances of an international and olympic future. so twenty-inch wheels and three gears it was then until my late teens, when it was discovered that five piece drumsets and raleigh shopping bikes were incongruous bedfellows. technology has shifted on apace since then, in quite substantial leaps and bounds. a ten-speed racer would be almost laughable nowadays, given that you can have that many at the back wheel alone. sturmey still exist but no longer under british ownership, and we now have wall to wall electronics to contend with as if 22 gears were not enough. it is, of course, unfair to take gearing out of context, for 'tis not simply those that have changed almost out of all recognition. 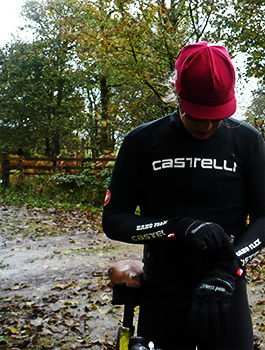 cycling these days is about as cutting edge as many other sports, and there are few items that conform to the standards thought adequate in days gone by. 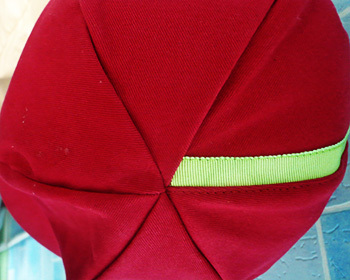 and that includes simple items such as the cycle cap. 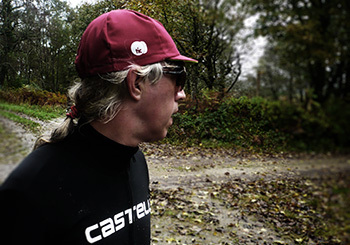 originally headwear issued to professional team riders and duplicated across the board by the pelotonese, they were usually of simple cotton emblazoned with the logo of the team sponsor or that of the club name and logo. 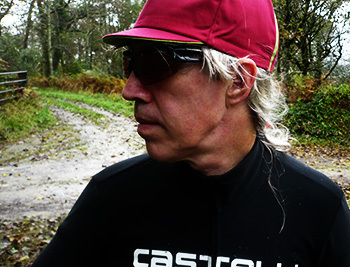 but as cycling has modernised and become less the preserve of the pelotonic wannabe, not everyone has the need or desire to join a cycle club, but still a pragmatic desire to own and wear a cycle cap. these, more often than not these days, are bereft of both advertising and cycle legend, and one of the newest kids on the block is the enigmatically named this is cambridge. i've paid testament on a previous occasion to their startlingly sartorial merino example which has now been followed by a no less stylish cotton example, in this case making excellent use of a bizarre mix of burgundy and lime (though other colour combinations are avilable). its five panels of brushed cotton eschew the more regular ribbon stripe down the centre by opting for placement down the left side. eccentric but highly favourable. though they do say so themselves, i am more than happy to concur; ...it would not be a This is Cambridge cycling cap if it did not look stylish when the owner exchanges their handlebars for espresso cups" (not literally, of course. it's very difficult to steer a bicycle with coffee cups). in common with its more luxuriant predecessor, it not only fits comfortably under a cycle helmet (a mavic plasma and giro air attack), but elicited favourable comment from others occupying debbie's at the time of my froth supping. as with many a cap in and out of the modern day peloton, one size fits all, and its price belies the quality of its presence. remember, christmas isn't all that far away, and what cyclist in anyone's life would not be more than grateful to receive handmade headgear, while relieving you of only £19?